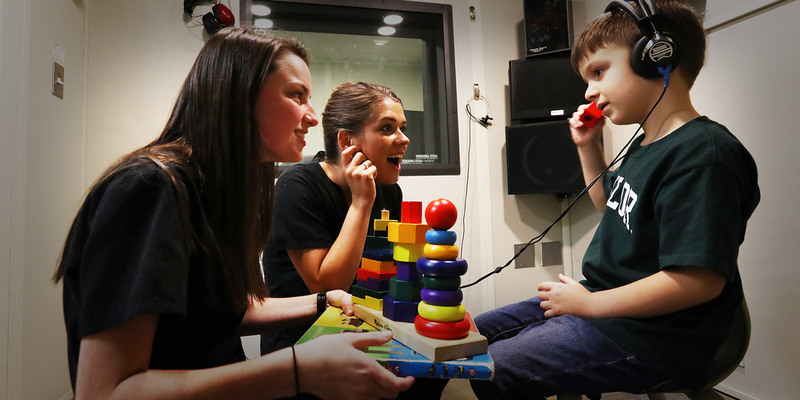 The Department of Communication Sciences and Disorders offers a Master of Science (MS) degree, with two tracks: a non-thesis track and a thesis track. Most students seek the non-thesis track, which prepares them to become certified professional speech-language pathologists. Students on the non-thesis track must complete forty-five (45) semester hours and pass the required final comprehensive examination to earn the MS degree. This is equal to 4 semesters (i.e., terms). The thesis-track is designed for those students interested in participating in graduate research culminating in a thesis with the ultimate goal of pursuing doctoral study. The thesis track requires the completion of forty-two (42) semester hours, three (3) of which are earned by the completion of a thesis. Students considering the thesis track should contact the Department’s graduate program director to discuss the advantages of pursuing this option. A Student who has been accepted to Baylor's CSD Graduate Program, but did not have an undergraduate degree in CSD is considered a Graduate Student with Leveling Status. These students are required to complete 26 hours (two semesters) of undergraduate courses in Baylor's CSD Department, to meet requirements for state licensure and professional certification. After completing the required 26 hours, the student will begin the Standard Graduate Track and will no longer be able to take undergraduate coursework to fulfill graduate course requirements. Students enroll in 4 semesters (i.e., terms) to complete their graduate program. Please see the Graduate Leveling page for additional information. Graduate students must take the National Examination in Speech-language Pathology prior to graduation and submit their scores to Baylor University. Students completing the master's degree in Communication Sciences and Disorders will meet the coursework and practicum requirements for certification by the American Speech-Language-Hearing Association, and for licensure by the state of Texas. Certain graduate courses are required of all students to ensure that students are exposed to a variety of areas in speech-language pathology and audiology. In addition, students may choose from the remaining 4000 or 5000 classes to complete the degree. For course descriptions, please see the Graduate Catalog.